Check out what satisfied customers have been saying! Scroll down to submit your own. "As a single mom, I am very picky both about who comes into my home, and what products they use for cleaning. I was very comfortable with Bob Green when he cleaned my carpets. He showed an attention to detail I have never seen and by the time he was done, the carpets looked better than when I moved in! Best of all, he used a dry cleaning method that was toxic free and left my carpets looking and smelling terrific without harsh chemicals my pets or my children could react to in a bad way. I highly recommend Bob Green for all his services." "I am writing to highly recommend the services of GREEN SOLUTION BUILDING SERVICES. 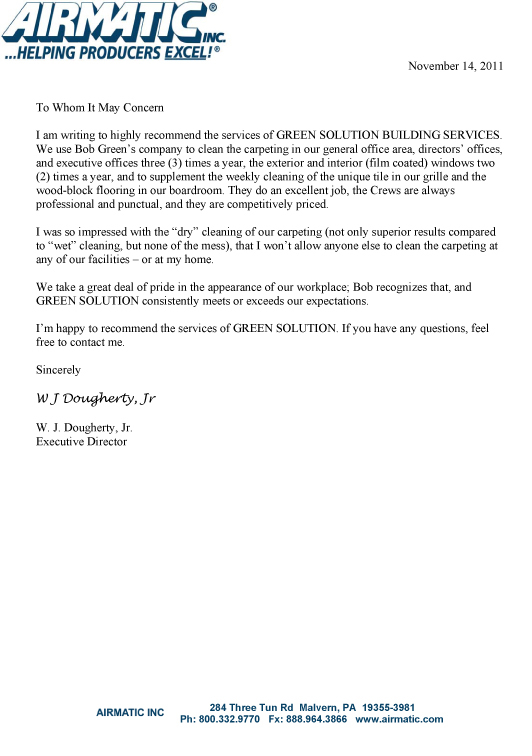 We use Bob Green's company to clean the carpeting in our general office area, directors' offices, and executive offices three (3) times a year, the exterior and interior (film coated) windows two (2) times a year, and to supplement the weekly cleaning of the unique tile in our grille and the wood-block flooring in our boardroom. They do an excellent job, the Crews are always professional and punctual, and they are competitively priced. 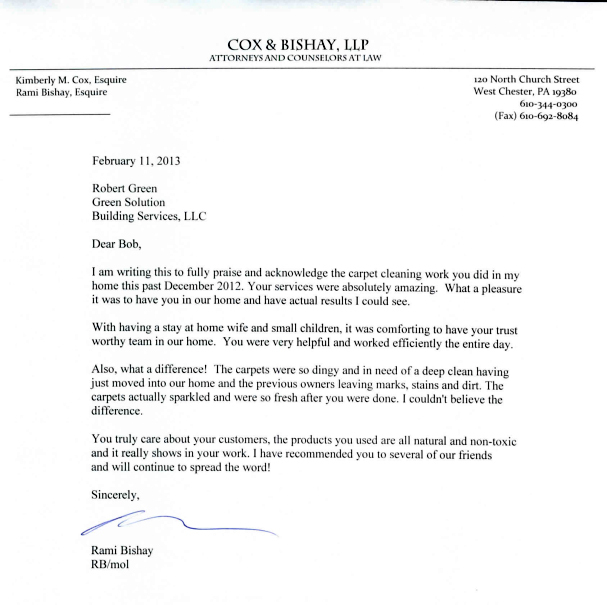 I was so impressed with the "dry" cleaning of our carpeting (not only superior results compared to "wet" cleaning, but none of the mess), that I won't allow anyone else to clean the carpeting at any of our facilities – or at my home. We take a great deal of pride in the appearance of our workplace; Bob recognizes that, and GREEN SOLUTION consistently meets or exceeds our expectations. I'm happy to recommend the services of GREEN SOLUTION. If you have any questions, feel free to contact me." 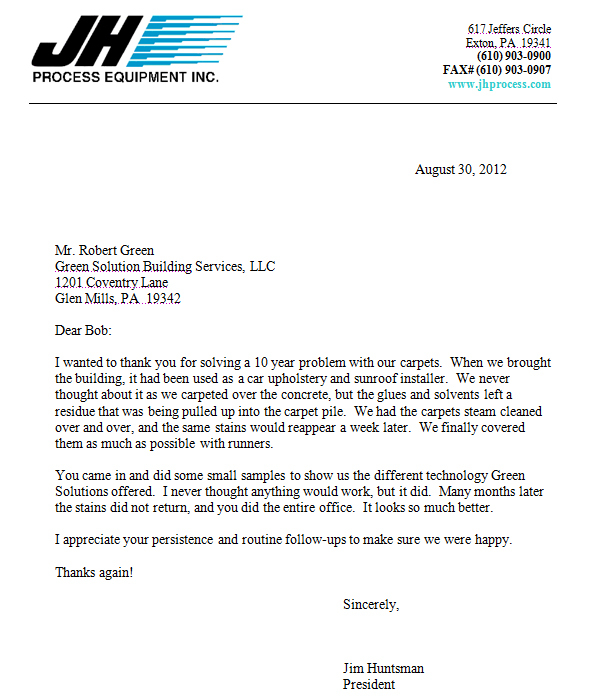 I wanted to thank you for solving a 10 year problem with our carpets. When we brought the building, it had been used as a car upholstery and sunroof installer. We never thought about it as we carpeted over the concrete, but the glues and solvents left a residue that was being pulled up into the carpet pile. We had the carpets steam cleaned over and over, and the same stains would reappear a week later. We finally covered them as much as possible with runners. You came in and did some small samples to show us the different technology Green Solutions offered. I never thought anything would work, but it did. Many months later the stains did not return, and you did the entire office. It looks so much better. I appreciate your persistence and routine follow-ups to make sure we were happy.